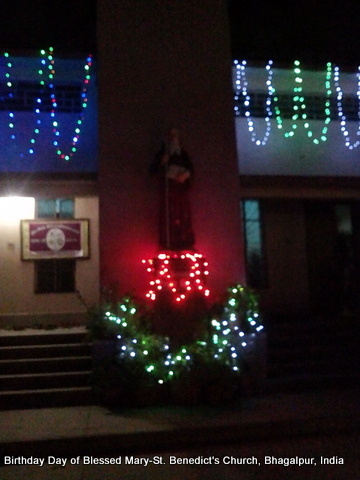 Birthday of Blessed Mary – St. Benedict’s Church, Bhagalpur, India. 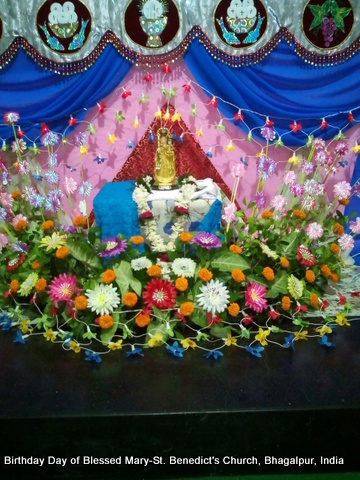 Photos of Holy Mary Birthday (Ettu Noimbu) celebration at world famous Marian pilgrim centre, St. Mary’s Forane Church, Kuravilangad. 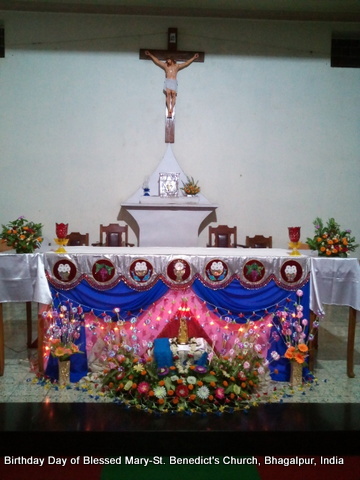 September 1st-8th, fast days for the whole parish. Spetember 8 celebrated as Mothers Day. The land of Kuravilangad is blessed by the esteemed presence of St. Mary’s Forane Church, which was built in 105 A.D(just one hundred years before Constantine declared Christianity as the official religion in the Roman Empire). 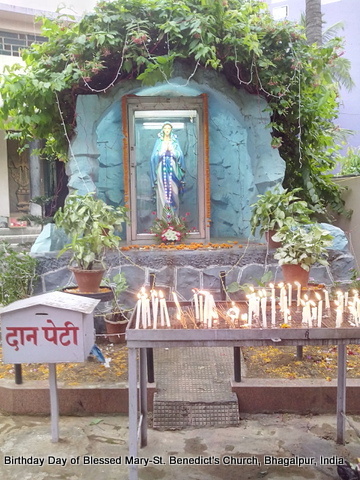 It is believed, Mother Mary’s first appearance in the world, was in Kuravilangad. 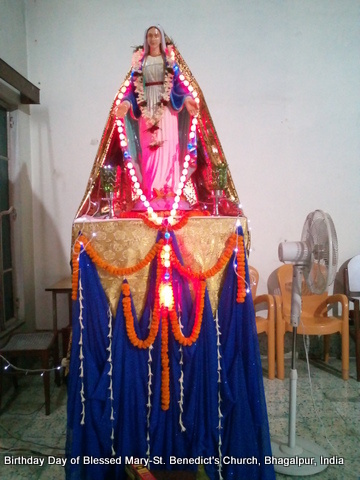 Our Lady appeared to a few children at Kuravilangad, who were tending their flock in the bushes. Our Lady asked them to build a church at the place from where a miraculous perpetual spring sprouted, a spring which exists even today. 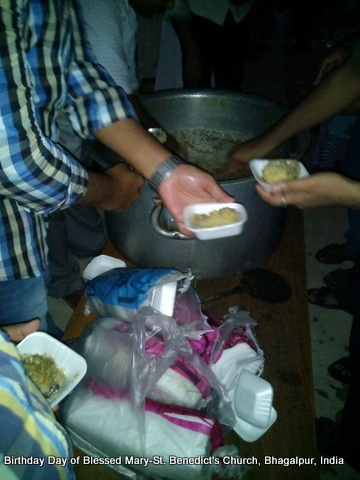 The children reported the events to the elders and a church was built there. 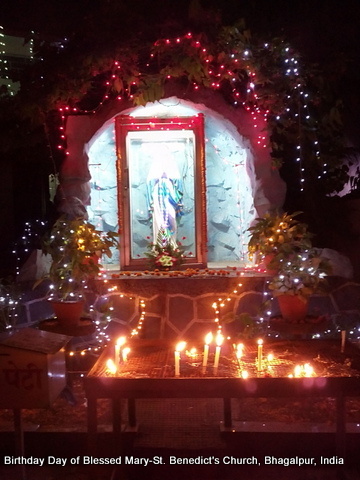 Rosary procession carrying lighted candles make this celebration more attractive and devotion. 5 Now Rebekah was listening when Isaac spoke to his son Esau. So when Esau went to the field to hunt for game and bring it, 6 Rebekah said to her son Jacob, “I heard your father say to your brother Esau, 7 ‘Bring me game, and prepare for me savory food to eat, that I may bless you before the Lordbefore I die.’ 8 Now therefore, my son, obey my word as I command you.9 Go to the flock, and get me two choice kids, so that I may prepare from them savory food for your father, such as he likes; 10 and you shall take it to your father to eat, so that he may bless you before he dies.” 11 But Jacob said to his mother Rebekah, “Look, my brother Esau is a hairy man, and I am a man of smooth skin. 12 Perhaps my father will feel me, and I shall seem to be mocking him, and bring a curse on myself and not a blessing.” 13 His mother said to him, “Let your curse be on me, my son; only obey my word, and go, get them for me.” 14 So he went and got them and brought them to his mother; and his mother prepared savory food, such as his father loved.15 Then Rebekah took the best garments of her elder son Esau, which were with her in the house, and put them on her younger son Jacob; 16 and she put the skins of the kids on his hands and on the smooth part of his neck.17 Then she handed the savory food, and the bread that she had prepared, to her son Jacob. 30 As soon as Isaac had finished blessing Jacob, when Jacob had scarcely gone out from the presence of his father Isaac, his brother Esau came in from his hunting. 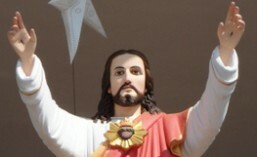 31 He also prepared savory food, and brought it to his father. And he said to his father, “Let my father sit up and eat of his son’s game, so that you may bless me.” 32 His father Isaac said to him, “Who are you?” He answered, “I am your firstborn son, Esau.” 33 Then Isaac trembled violently, and said, “Who was it then that hunted game and brought it to me, and I ate it all[a] before you came, and I have blessed him?—yes, and blessed he shall be!” 34 When Esau heard his father’s words, he cried out with an exceedingly great and bitter cry, and said to his father, “Bless me, me also, father!” 35 But he said, “Your brother came deceitfully, and he has taken away your blessing.” 36 Esau said, “Is he not rightly named Jacob? For he has supplanted me these two times. He took away my birthright; and look, now he has taken away my blessing.” Then he said, “Have you not reserved a blessing for me?” 37 Isaac answered Esau, “I have already made him your lord, and I have given him all his brothers as servants, and with grain and wine I have sustained him. What then can I do for you, my son?” 38 Esau said to his father, “Have you only one blessing, father? Bless me, me also, father!” And Esau lifted up his voice and wept.